The Molonglo Valley is a significant region in the ACT, known for its riverside landscapes, Aboriginal heritage and rich biodiversity. It is also home to nationally threatened ecological communities such as the Pink-tailed Worm-Lizard and Box-gum Grassy Woodland. 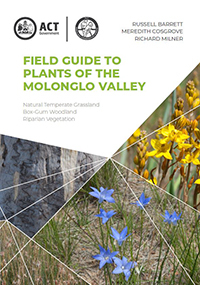 The Field Guide to Plants of the Molonglo Valley includes 394 native and exotic forb, fern, grass, sedge, rush, shrub and tree species, covering the majority of all known plant species to occur in the Molonglo Valley and lowland grasslands and woodlands across the region. It includes multiple photographs for each species, with key ID features, flowering and fruiting times, rare or weedy status, plant use and management notes, and a visual and text glossary of botanical terms. The easy to use field guide provides a tool to members of the Canberra region to better appreciate, enjoy and understand the diversity of life on their doorstep. Alternatively, you can contact Richard.Milner@act.gov.au for sales and any further information. Want to find out more about the ACT’s unique biology?